I could be wrong, but the sway control isn't a sway bar but rather an electronic sensing system that works with the brakes, there isn't any extra hardware associated with it. You are correct. There is no sway bar, only electronic sway control. The only item in the tow package that improves towing capacity is the heavy-duty radiator. Its questionable as to how much the heavy-duty radiator really improves tow capacity under normal conditions. The tow package does not include upgraded suspension or brakes. It doesn't make sense that the heavy-duty radiator alone more than doubles the towing capacity. Maybe towing up a long uphill grade at high ambient temperatures. Most likely the "stock" van can tow more than 1500 pounds under most conditions. Just keep an eye on water and transmission temperature and take appropriate action if it becomes necessary. There is the warranty issue but that may be a low risk. That's also a rampant internet myth that's been out there forever. Negligence can't be used to deny an insurance claim. Heck, that's the whole purpose behind car insurance. Someone is almost ALWAYS negligent when an accident occurs, but it's virtually unheard of for an insurance company to deny a claim on that basis. They deny claims every day based on coverages and fault(collision vs. liability and assigned responsibility), but never negligence. That's why DWI victims still get their losses covered despite gross criminal negligence on the part of the person who was drinking. The drunk operator's vehicle is also covered if he paid for collision coverage, but of course the insurance company will frequently drop coverage because of risk after paying the claim that they are legally required to pay. I've chatted with a few law enforcement officers over the years about this, and they all agree on one thing. There is no legal meaning behind manufacturer's recommended towing capacities. The only enforceable standards are what are on the door sticker, which are GVWR and GAWRs. GCWR isn't listed on a passenger vehicle or light truck's sticker, so that limits what you're legally responsible for in the event of an accident investigation. Has anyone seriously heard of state police scraping up an accident scene, piling all the bits of rubble into a truck, and hauling everything to a scale? I've yet to find a single example in any state. You may be correct in that the insurance co will pay out the claim, but they would most likely drop you from their coverage due to negligence. You would then be opened to any litigation that might follow due to your negligence. It wouldn't take much more than a VIN search to figure out if your vehicle included the tow package and to see the manufacturers weight ratings for it. 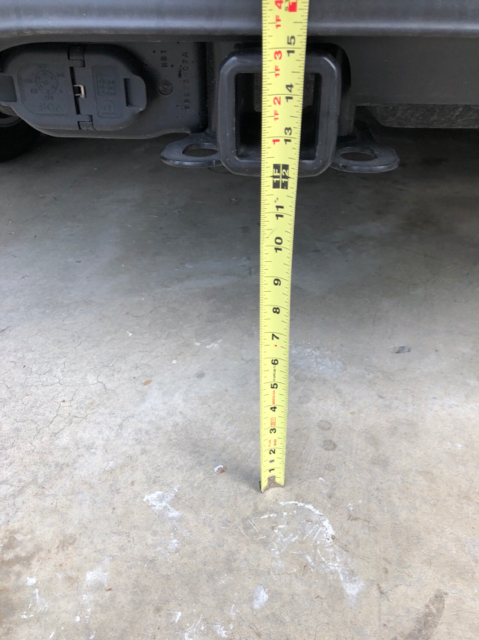 If you're towing a trailer with an unloaded weight rating > 1500lbs and you don't have the tow package from the factory, you would be considered negligent and would most likely lose any lawsuits that would follow. Everyone seems to be speculating on what all changes are made to the tow equipped vehicles. Whatever they are, the engineers deemed it unsafe to pull > 1500lbs without a tow equipped vehicle. This type of debate happens all the time on the truck forums I follow, where folks boast of pulling 12-15k rigs with trucks rated at 10k. Sure, the vehicle may be able to pull the weight, but you should also consider that its never just you out there on the road. For anyone who has the tow package. Do you have to turn on the Sway control in a menu somewhere? If you do not, i have a feeling this is just part of the electronic stability system and is being marked as sway control. Any car with stability management will check wheel speeds and see the rear is rotating and should apply breaks to bring it back in line. For warranty issues, how would a dealer prove you towed more than 1500 lbs? For liability, If you get in a wreck and it's your fault, it's your fault. If its the other guys fault, it's his fault. Don't see how tow rating would ever come up. If i run a red light, and hit a car, towing capacity wont come up. If a guy rear ends me, not going to come up. I cant thing of really any situation where fault would be determined based on towing capacity, especially when you are limited to 3500 LBS max, we are not talking 20,000 lbs loads here. 05192374AB - this appears to be a liquid to liquid cooler. Looks like coolant goes in 1 side, trans fluid goes in the other, so coolant is used to cool trans fluid. 68217322AA - this is listed as an air cooled trans cooler, and looks to be in front of the radiator. I am not sure if the van uses both, it towing get both, non towing gets only the small one. If you rear-end someone and they decide to go after you for more $$ than the insurance payout, you could be in trouble for pulling more weight than the vehicle was designed to safely pull...and stop. There are plenty of ambulance chasers out there that will look for any angle to separate you from your $$ and this negligence would be all they need. Either way it's ultimately your choice. Just seems to me that the cost of tow package is negligible compared to the worst case scenario otherwise. What’s the height of the bottom of the receiver tube? My Curt aftermarket hitch sits almost 10” off the ground. Great idea to post picture of the hitch. Here is the OEM one. You can see bottom of receiver tube is at about 12 and a quarter inches. So little more than 2” difference between OEM and aftermarket. They can go after you for more regardless. Parents are / were attorneys that handled car wrecks. They can gladly try to get more than what ins offers no matter what. In my state, it will come down to a Jury deciding on what you get. The fact that you were towing 2000 lbs when you were rated for 1500 may come up, but the fact is you are still at fault. Its also pretty pointless to try to get more than what your Ins covers, as most people dont have alot of assets, and certain things like Primary Homes and retirement are protected from litigation. 1. Bigger Alternator - I guess this would help with a larger trailer, as some trailers can be charged by the tow vehicle using a 7 prong plug. No affect on towing ability. 3. Trans cooler? - this is still up in the air if there is a difference in cooler between towing and not towing package vehicles. 4. Anti Sway - OK, if this is real, and i think its really just the built in stability software, it could help with sway, but sway is usually caused by an improperly balanced trailer to begin with. Most sway is caused by not enough tongue weight. Cross winds on a large profile trailer can cause it too. However since the OP is looking at a popup, this is not a huge factor. Now if the package included anything like this, then i would agree that the package really makes it safer and more practical to tow a larger load. But, since it does not, it really is just a way to sell a 1000$ package, that if more common, many of us would buy. However, they are rare, and in the case of my L, not even available. Bond007 and TomB985 like this. For us, it was about the alternate location of the hands-free sensors. If you don't have the factory hitch, the sensors are centered under the bumper. When you get the factory package they put the sensors on both sides of the hitch, so you can still use hands-free operation of the gate. That was a big piece for me. The larger radiator and alternator are nice-to-haves in my opinion. As for the anti-sway, I don't have a button for it. My understanding is it's a software module that is added to detect vehicle sway due to the addition of a towed object, and uses the Electronic Stability Control to apply braking pressure to alternate wheels to offset the motion and correct the sway. The hitch is a Class II hitch which I think aides in the towing capacity, but there must be more reason for the certified difference. Very well written, Nikbrewer, I completely agree. As far as cost, my aftermarket towing package cost me $180 for the parts and a few hours of my time. Had I been able to find a used van in my price range with the factory package, I likely would have sprung for it. But I don't have any interest in taking the depreciation hit on a new van, and used models with the towing package are as rare as hen's teeth. 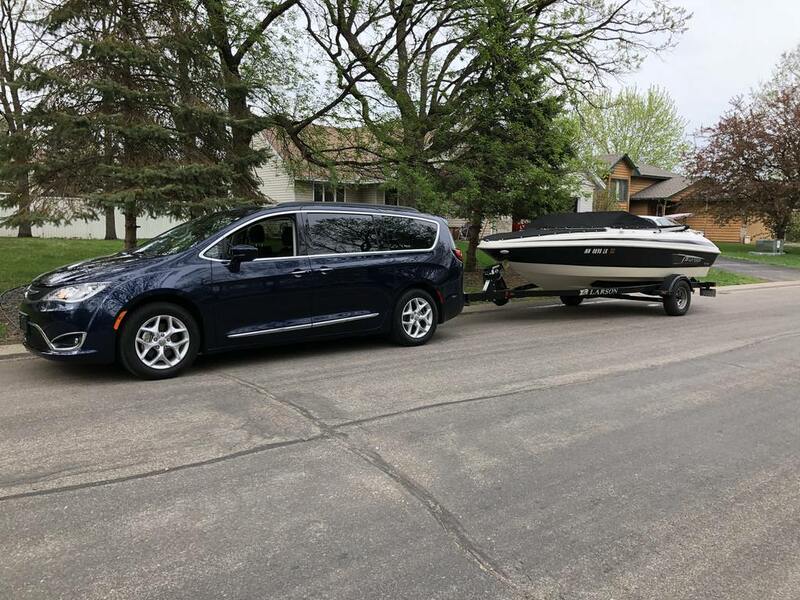 My boat has surge brakes and is right at the upper end of what the Pacifica is rated to tow at 3,500 lbs, and it is an extremely comfortable tow. No complaints whatsoever on power and handling, and the factory cooling system has done a fine job so far. I have no regrets at this point.